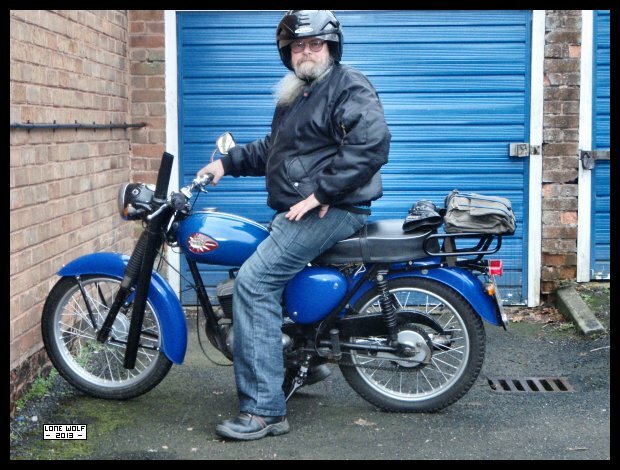 What's blue, smells of two stroke smoke and is extremely happy ? at the local hospital to make sure I didn't have a DVT. - Thanks to Gaz for the lift there at such short notice. After an ultrasound scan of the leg, they were able to tell me that the top of my leg was fine, but they couldn't say about the lower leg, which is where the swelling was. Friday and I return to the A&E department. This time they want me to have more antibiotics but they will not be available until three in the afternoon. This wasn't a problem seeing as I had a physiotherapy appointment at half past two. feeding time up at the Sanam with Andy M and his brother. but I found I could move my foot on to the brake pedal much easier than I could before. Looks like the new hip is doing what it should.